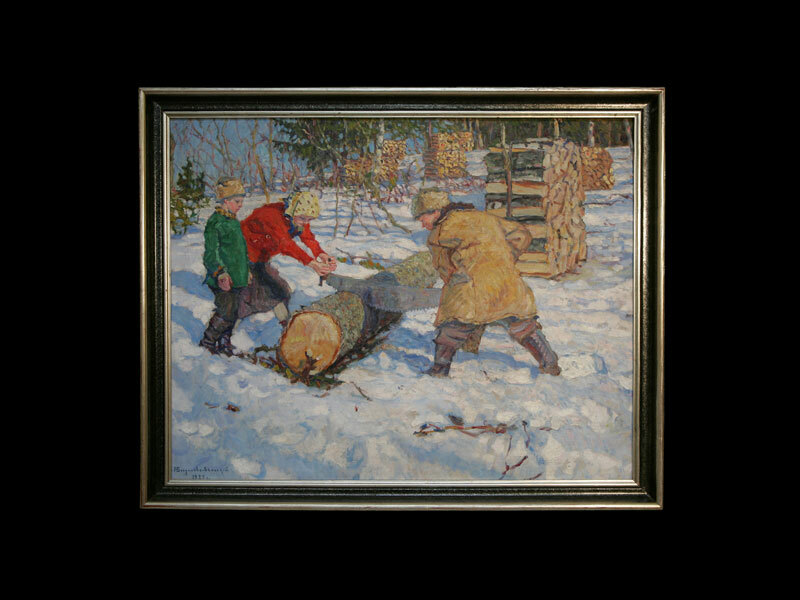 Work of Russian painter Belsky represents scene with three children in winter scenery and woods cutting. It has intense colors characteristic for the artist, with strong light and intense tones, where Belsky presents laborious life of children from Northern parts between the wars. This painting is one among works of Belsky that depict life of rural children. Bogdanov-Belsky was born in the village of Shitiki in Smolensk Governorate in 1868. First lessons he received about icon-painting at the Troitse-Sergiyeva Lavra in 1883, and later at the Moscow School of Painting, Sculpture and Architecture until 1889. From 1894 to 1895 he studied and worked at the Imperial Academy of Arts in St. Petersburg. He went to Paris on specialization at the end of 1890-tees.